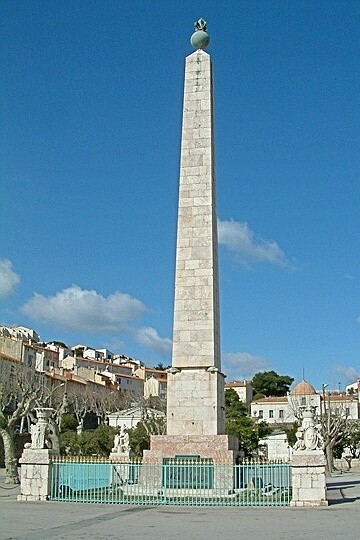 The obelisk in Port Vendres was erected in 1783 to commemorate the Independence of the USA, supported by France and declared at the Treaty of Versailles that year. It’s also significant as the “point zero” from which elevations are reckoned, allowing metric measuring of the altitude of all other countries. fixed in the early 19th century by scientist François Arago, born at Estagel in the P-O. The “point” is shown in vertical scale with three figures, top to bottom, 992, 992.5 and 993, engraved on the south-eastern face of the plinth. The figures are air pressures in tenths of a hectoPascal (HPa), because, as with aircraft altimeters, elevations are measured indirectly in terms of air pressure, which decreases with increasing elevation. There’s a persistent story that the three figures are in the wrong order, that 993 should be uppermost. It must have been started by someone who didn’t know the significance of the figures, but reasoned that they should increase with height. But pressure goes down with height, so the order is correct.